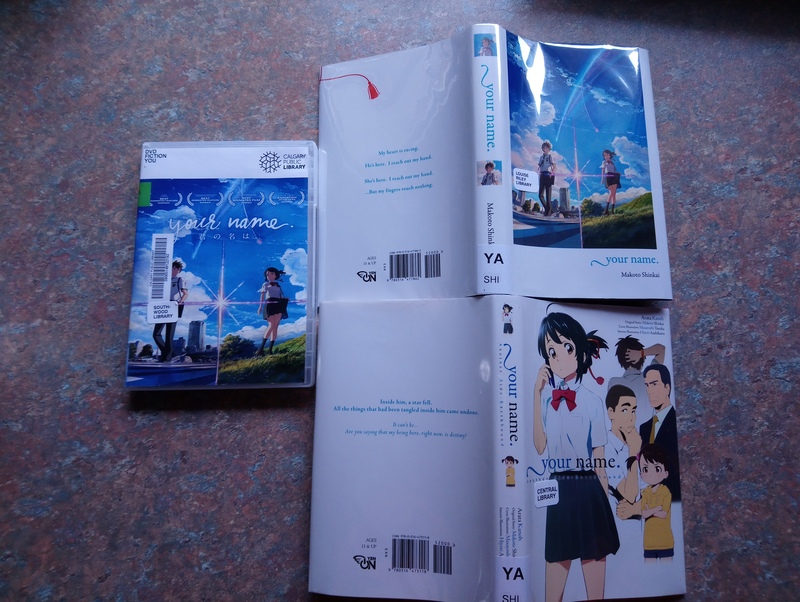 I LOVE Makoto Shinkai’s (新海 誠) Japanese animation Your Name 君の名は very much and is thrilled that the awesome Calgary Public Library has the movie (in both blu-ray and DVD) and also the two light novels (Your Name and Your Name. Another Side:Earthbound) as they serve for me as wonderful inspiration and chance for me to have some thought experiments re the adaptation! NOTE: I will try to expand on this post as I have more time and things to say. I LOVE the storytelling and the animation, etc but my one key inspiration or reminder is more technical. Famed Hollywood producer Brian Grazer talked about when he was 24 studio boss Lew Wasserman told him to get a legal pad and pen to create some of his own IP (intellectual property). Write a story. Write a book. Make a movie. Make … And create your own IP. The light novels serve as wonderful examples of having back stories for the characters and the environments they are in. Case in point, teach Miss Yuki in Your Name is reported by fan wiki site as the same as Yukari Yukino (雪野 百香里) in Shinkai‘s The Garden of Words (another great film I LOVE, very different from the story usually told by the master Hayao Miyazaki). There have been some negative press about Your Name being remade. I hope to have a few thought experiments of my own re how would I had adapted the screenplay if I were to have a chance to? And I would love to see how the Heisserer & Abrams version come out looking like. Oct 7th, 2018 update: I LOVE the movie Arrival directed by Denis Villeneuve and written by Eric Heisserer based on the the 1998 short story “Story of Your Life” by Ted Chiang, which I enjoyed as well. The adaption was beautifully done and magical. I really enjoyed the last bit of non-subtitled Chinese dialogue fragment. “Sims: A scene that really stuck out for me was the conversation between Louise and General Sheng. It felt like the lynchpin for the film’s message of understanding and communication, because we’ve only seen him as a stereotypical figure: the stern Chinese general that you see on the TV. BTW, the 2005 film Proof based on David Auburn‘s Pulitzer Prize-winning play Proof are both pretty cool. And I also LOVE the 1996 film The English Patient and even rushed to buy and read the novel of the same name by Michael Ondaatje. Adaption from play, short story, novel, etc are magical art. So I refuse to point blank declare the Oscar nominated Heisserer must fail with Your Name. Those who often without much knowledge nor talent are often the fast to declare things/challenges as “impossible”! (TBC) Hopefully more to be added later. This entry was posted on Friday, 5 October, 2018 at 11:51 am and is filed under Uncategorized. You can follow any responses to this entry through the RSS 2.0 feed. You can leave a response, or trackback from your own site.